"One way or another, they all end up in the undercity." Jarad, Golgari Lich Lord is the evolution of one of my oldest EDH decks. 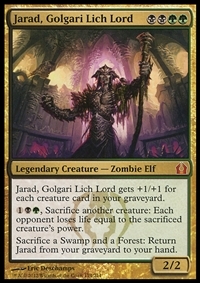 It was originally Savra, Queen of the Golgari, then Nath of the Gilt-Leaf, but once Jarad was released I converted the deck and never looked back. This deck is as much of a "good stuff" deck that I have ever put together. It runs a ton of removal, recursion, and card draw (and it could run even more if the deck needed it), so the deck naturally wants to play a very controlling game. The deck wins with multiple Jarad activations, overwhelming players with card advantage, or a timely Living Death, Genesis Wave, or Profane Command. -1 Bane of the Living - I really like this card, but I figured I had enough sweepers and I liked most of the Sorcery options too much to cut them over this. -1 Ink-Eyes, Servant of Oni - I hated to see this go (especially in combination with the various Wood Elves variants), but it didn't fit the theme as well once I converted this from Nath. -1 Cloudthresher - Another casualty of 'too many sweepers', but this one was significantly worse than anything else I was running and it came out so that I could run Polukranos. -1 Kamahl, Fist of Krosa - This is high on my list of cards to put back into the deck. Having a tutorable Overrun effect like this in the deck would often come in handy. -1 Visara the Dreadful - A sad day when Visara is not good enough, but I was already flooded with 6-drops and I didn't need the added removal. -1 Grave Titan - As pure value he is very good, but in the end he was not as good as the other 6-drops I wanted to run. -1 Avatar of Woe - I didn't need the added removal even in light of the fact that this would often come down for only BB. -1 Rancor - Solid card that is somewhat unnecessary when better creature choices are made. -1 Green Sun's Zenith - I had to cut one of the creature tutors when I added Birthing Pod and this was the worst. -1 Harmonize - I don't have a problem with having too few cards in this deck. Harmonize would often rot in my hand with no need to ever cast it. -1 Vraska the Unseen - Included in the deck primarily because of her colors, she is actually a fairly decent deal for the cost. She was cut mostly to just being redundant with other removal already in the deck. -1 Mimic Vat - This decks wants its recursion to occur from the graveyard and this sometimes gets in the way of that. -1 Polukranos, World Eater - There is plenty of creature kill already and this is inefficient at best. +1 Protean Hulk - Card was just unbanned today, so I'm going to put it into the deck that naturally wants it the most. -1 Terastodon - Nasty Terasty was basically in there as a 8-drop cap for Birthing Pod, but I can live without it. +1 Blackblade Reforged, -1 Pitiless Plunderer: Pitiless Plunderer was not as good as I thought it would be in this deck. +1 Demonlord Belzenlok, -1 Greenwarden of Murasa: Trading in one form of CA for another. +1 Multani, Yavimaya's Avatar, -1 Massacre Wurm - The Wurm is a decent sweeper and an occasional source of damage, but I think Multani has much more damage potential as a huge creature to fling with Jarad. +1 Llanowar Wastes, -1 Temple of the False God - the deck has all sorts of tricky mana requirements, so I needed to cut a colorless land. I use all the other 4 all the time, so TotFG had to go. As you can see by the card choices, the deck runs very few "cute" cards or cards that only synergize with Jarad. Instead of being a deck that relies on its commander, this deck uses Jarad mostly as a finisher so synergy with Jarad is not a high priority. Coupled with the various forms of creature tutoring available in the deck (Survival of the Fittest, Fauna Shaman, and Birthing Pod), we can be very select with our sacrificial fodder. Deathrite Shaman - A nice collection of abilities that allow for the deck to ramp in the mid or late game, but its biggest use is to keep the opponent's graveyard clear of creatures prior to casting Living Death. Sakura-Tribe Elder - The perfect ramp card for this deck; can be recurred with Oversold Cemetery or Genesis o help ramp into our late game cards. Nezumi Graverobber - Keeps opposing graveyard shenanigans to a minimum until it flips where it turns opposing creatures against their opponent. Fauna Shaman - One of the decks three main tutoring engines that also feed Oversold Cemetery and help set up Genesis. Viridian Zealot - One of a couple of different cards for removing artifacts or enchantments, this one does me a favor and puts itself in the graveyard to be recurred. It also gets around Torpor Orb if the need arises. Scavenging Ooze - More graveyard hate that also doubles as a small lifegain engine. Wood Elves, Farhaven Elf, Yavimaya Dryad - Creature-based forms of ramp are perfect here. The provide ideal fodder for Skullclamp and are all recurrable with Cemetery and Genesis. Yavimaya Elder - The green Ancestral Recall is perfect for a recursion deck. Eternal Witness - When you don't need to recur a creature you recur this to get back whatever Instant, Sorcery, Enchantment, or Artifact you might need. Burnished Hart - Another ideal form of ramp for a graveyard deck. Bone Shredder - Some spot creature removal that provides Skullclamp fodder or sacrifices itself to be recurred. Oracle of Mul Daya - A green staple of card advantage and ramp. Ravenous Baloth - There is a small lifegain theme in the deck that allows the deck to come back from otherwise dire positions. Disciple of Bolas - Lifegain is nice but the card draw is the primary reason to run this. Polukranos, World Eater - I like this card. Running more sweepers makes less sense once you have control of the board, but running a few cards like this that can take out a few problematic creatures at once can really break open a game. Kagemaro, First to Suffer - One of many sweepers in black, this one is recurrable and can get huge once your hand refills. Thragtusk - Lifegain plus it leaves a body behind if killed or sacrificed. Living Death - Mass creature kill coupled with mass creature recursion... what's not to like? Primal Command - Creature tutoring, killing non-creature permanents, and graveyard hate all wrapped into one package. It can also gain a nice bit of life in a pinch. Garruk, Primal Hunter - There are a ton of good Planeswalkers in black and green, but this version of Garruk is the best for what this deck needs/wants in my opinion. Grave Sifter - I think you need more of a tribal theme than what I am running, but this is pretty good in any deck that can control the opponent's graveyards. It wasn't bad, but it also wasn't good either. I think that this card will find a place somewhere, jut not here. Lifeblood Hydra - Surprisingly good, yet it is too mana inefficient. Palace Siege - This deck wants a lot of this effect. Sidisi, Undead Vizier - I wanted to try a little tutoring in the deck, and this fits the theme. Nothing - Nissa, Vastwood Seer seemed like it might have a place, but in the end I never even tried it. Greenwarden of Murasa - Another Eternal Witness effect is well worth checking out. Mazirek, Kraul Death Priest - Amazing little creature that ended up in my Ghave deck, but it was perfectly fine here too. Seed Guardian - I wanted to try this out because it had been a while since I tested Mitotic Slime and I wanted to know how this would stack up. The Gitrog Monster - This card also kinda deserves its own deck, but it found a home here for the time being. Ishkanah, Grafwidow - There is a lot to like here, but it feels weak overall. Rishkar's Expertise - Interesting ard to try here, but card draw is not an issue with the deck. *Bontu the Glorified - The deck doesn't run a ton of sac outlets as it normally relies on Jarad for most of it's sacrificing. Bontu gives the deck a very in-theme way to turn creatures into both damage and card advantage that survives my Wrath effects. Liliana, Death's Majesty - Having some reanimation and some way to feed Oversold Cemetery was nice, but the ultimate is very lacking for a deck that only had 3-4 Zombies. *Rhonas the Indomitable -From granting Trample to high power creatures to pumping up a creature pre-flingage by Jarad to surviving my Wrath effects, Rhonas is a solid card in this deck. Vizier of the Menagerie - I liked this card, but in the end I had better card advantage options. Apocalypse Demon - I had a copy so I tried it out. It's not bad as Jarad fodder, but overall it just didn't make sense to run it over my other 6-drops options. Razaketh, the Foulblooded - This is a good card that ended up in another deck, but was otherwise fine to run here despite the high casting cost. *Uncage the Menagerie - Amazing at X = 3 through 6 in this deck. Vraska, Relic Seeker - Solid removal and token generator, but overall it wasn't anything that the deck really needed. Ghalta, Primal Hunter - The potential to get 12 power worth of creature into play on the cheap is something to look at, but I don't think its going to make the deck in the long run. Journey to Eternity - This card was made for this deck, although I'm not sure about how much I'm willing to open myself up to 2 for 1's with it. *Pitiless Plunderer - I really liked this card once I got a few more sac outlets into the deck. Vona's Hunger - I didn't like this as much here as I did in other decks. When this deck needs a sweeper, the sweeper needs be able to take everything out and not leave the opponent with their best creature behind. World Shaper - By adding in a few fetchlands I felt this might have a shot. *Greenwarden of Murasa - I tried this card out again at the suggestion of another player and I felt like it had to have a permanent spot in the deck. *Palace Siege - I wanted to reinforce that this deck really wants to recur creatures. Ravenous Baloth - I like that it self-sacrifices, but it doesn't do enough otherwise. Arashi, the Sky Asunder - I like the anti-Flyer Wrath that is recurrable, but I have better removal options overall. Brutalizer Exarch - I've just cooled on this card over time; it's plenty of value but it costs too much. Sensei's Divining Top - I'm just pulling it for space considerations. Primal Command - Great card that isn't necessary in this deck anymore. Burnished Hart - Another good card, but I had a glut of 3-mana land searchers and this was the worst one. Blackblade Reforged: Since Jarad, Golgari Lich Lord's ability cares about the creature's power, this seems like an ideal fit for doling our tons of damage. With 8 Legendary creatures already in the deck and potentially more coming in, this seems worth testing. This deck is also pretty good at generating mana, so perhaps Equip isn't really a problem. Demonlord Belzenlok: I'm thinking that this might be able to replace either Gleancrawler or Greenwarden of Murasa, as both of those cards have some overlap (they recur cards fro the graveyard) and are 6 drops. Belzenlok would also provide card advantage, but doesn't rely on the graveyard (where I already have tons of recursion). Being a 6/6 Flyer is also better stats-wise than the others, not to mention it can carry Blackblade Reforged a little easier. Helm of the Host: I think this would be good here, but I don't want to overload on equipment or expensive cards. Multani, Yavimaya's Avatar: I'm pretty sure I can get this up to pretty epic proportions given a game going long enough, and I love that it has Trample. It's another Legendary creature that could hold Blackblade Reforged on the cheap, and I think it just plays so well with the land-ramp theme that I should look at including it somehow. Slimefoot, the Stowaway: I think that for the sake of space I'm unlikely to find a home for this here, but I like the idea of being able to churn out Saprolings as fodder for Skullclamp, Bontu the Glorified, or Ghoulcaller Gisa. Thallid Soothsayer: I have been really liking this card in my Endrek Sahr deck, and I think it could be good here. For the most part, this deck doesn't generate a lot of small fodder to feed an effect like this; it's mostly geared towards Jarad Flingage of fatties. I think I'm going to keep the decks distinct enough from one another that I'm going to pass on this. The Eldest Reborn: I'm a little on the fence about Sagas in general, but this one seems like it would be pretty good here. It will be harder to recur than a creature if I want to get multiple uses out of it, but if I can get a 7-for-1 over three turns (assuming a 4-player game) then that seems well worth it. The Mending of Dominaria: Chapters I and II seem great, but Chapter III shuffling my graveyard back into my library is a deal-breaker for me. Yawgmoth's Vile Offering: This self-exiling makes it a bust for me. That leaves out The Eldest Reborn for now.